Acronyms at bottom of page. States that "UUK are actively discussing potential benefit changes as a means to reduce costs of provision"
Responds to 'A technical response to commentary on asset projections', Guy Coughlan, 16 Oct 2018. Specifically criticises Coughlan for claiming that Sam Marsh's new Test 1 calculations assume a smoothing of contributions over 20 years. Criticises USS's governance structure for preventing the flaws in Test 1 from coming to light. Argues that contributions need to rise now to fund the new liabilities being created even if they will fall later assuming interest rates rise, and that de-risking is needed because interest rates may not rise, or there may be a market shock. This and 'A technical response' (above) are a response by USS to 'USS's valuation rests on large and demonstrable mistake', Michael Otsuka, 13 Oct 2018. Focuses on the danger of 'downside events', and the possibility that interest rates may not rise, to justify de-risking. Sam Marsh's third submission to the JEP. Briefly rejects several claims in 'The state of USS', David Miles, 24 Jul 2018. Argues that USS have made a mistake in assuming TP liabilities in 20 years will equal assets, and so in formulating Test 1 to ensure that the gap from the former to the self-sufficiency value of liabilities is within the permitted £10bn. This design fails to capture the underlying rationale of Test 1. Sam Marsh's calculations show that if Test 1 were formulated in terms of prudently projected assets it would be met with no need for de-risking between years 0 and 20.. Recommends various tweaks to the 2017 valuation which would reduce contributions to 29.2%. Includes a long discussion of Test 1. Sam Marsh's second submission to the JEP. Using USS-provided figures calculates that if de-risking were abandoned the current deficit would be £0.4bn, and this would become a large surplus by year 20. Sam Marsh's first submission to the JEP. Summarises Test 1 step by step and finds it unfit for purpose. Announces result of e-ballot: 64% yes, 36% no, 65% turnout. 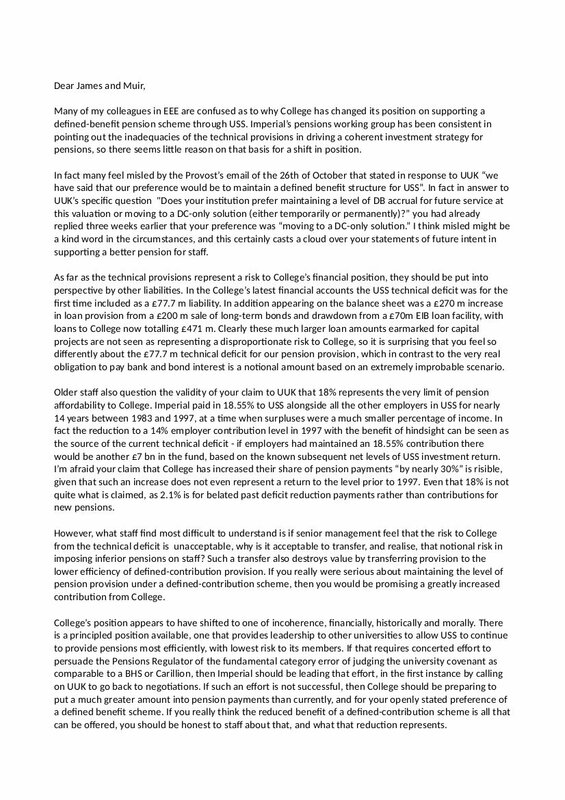 Distributed at UCU delegates meeting on 28 March, published in UCU press release of 4th April, says that UUK does not intend to return to the January decision to end DB, says UUK is committed to 'maintaining a meaningful defined benefit pension offer at this valuation'. The 'November valuation'. Reports that UUK has indicated that employers want to reduce the risk of having to pay higher contributions later, that USS has decided to shift investments towards bonds now rather than in 10 years time, and that consequently the funding deficit is now £7.5bn, requiring an 11.4% increase in contributions. Argues that USS's preoccupation with the month to month level of 'reliance' (the self-sufficiency deficit) is irrational. The 'September valuation', also available here. Discusses Test 1 on pages 40-42. The 'February valuation'. Mentions the rationale for Test 1 on page 10. Discusses the rationale for Test 1 on pages 10-13, reprints as Appendix A the pages on the test from 'An integrated approach to scheme funding', Jul 2014. My aim is to post links to all important documents relevant to the origins and course of the 2818 USS strikes, from whatever source, and to include a 2-3 line summary of what I think are the most significant points of each document. I avoid evaluative language in my summaries but of course I have to use my own judgement in deciding which documents are important and which are their most significant points. In deciding whether to link to a 'comment' document, i.e. one that advocates a particular course of action, I try to focus on how well-informed and well-reasoned it seems to be rather than its standpoint. In general I avoid linking to very short blog posts and Twitter threads. Many thanks to all who have sent suggestions.